Most of us want to live in an environmentally conscious way and put our values into practice. In this web exclusive interview, Low Carbon Diet author David Gershon (of The Empowerment Institute), discusses how to make effective changes in our day-to-day lives so we can live what we believe in. For twenty-five years, David Gershon has been working to empower people to make change both individually and in organizations. Last year, his organization, the Empowerment Institute (www.empowermentinstitute.net/lcd), published a book called Low Carbon Diet: A 30-day Program to Lose 5000 Pounds that is focused on teaching people how to make effective decisions about how to be more considerate ecologically. Below, he tells ascent all about change, community and creating sustainable habits. Q: Your work focuses not only on what we need to do to be more ecologically friendly, but also how to change our behaviour effectively. Can you tell us about this last part? How does a person make lasting changes? A: The key to change is making the changes in the first place. Studies suggest that people sustain changes once they've made them; the biggest challenge for most people is getting around to changing the things that they want to. The systems, the patterns in your life are distinct things that are built. Some are habits like turning off your lights when you leave a room or powering down your computer when you're not using it. It's hard to get them going but once you've got it, you've got it. But without a peer support system, people sort of fall off the path. Things fall through because there's nothing driving them, there's no accountability system. The key is a physical connection – the social side is really a wonderful part of it. We're seeing that the structure of peer support is very effective. Human beings have the ideals, the values, the aspirations, but changing habits and re-structuring our lives takes time and effort. Most of us don't do that very well. Q: Where does the will to make change come from, especially group change? A: Something inspires you and you want to do something. I don't think there's much problem in convincing people that change needs to happen. Certainly a lot of people get it. Getting people to act on that, and act effectively, is the issue. A lot of my work with the Empowerment Institute is building the capacity of people who are actively stepping forward to make their community better. Their impluse is to make things better, but they may not be very effective at it. That's the key – making people who have the disposition toward change effective at creating it. Q: When most people think about being more environmentally-friendly, the phrase “reduce, reuse, recycle” comes to mind. Is this enough? Is it up-to-speed with current environmental thinking? A: We've gone substantially beyond “I recycle, therefore I'm an environmentalist”. Most people who are “green” do not have a low carbon lifestyle, so the big wake up call for green people is that we now have to look at much more substantial change in terms of our carbon impact. Some things are more important than others—the most important things are how you use your car, how you travel and how you use electricity. One of the actions in the program is to start a Cool Community Campaign to reduce their carbon footprint, starting with what we call the Global Warming Cafe that gets people talking about important issues and then we get people into EcoTeams to do the Low Carbon Diet. That's where we have to go, that's where the real work is. Anyone who doesn't pay attention to these things will start to have social pressure on them to change. Look at Al Gore and his house—he has a big house and a big carbon footprint and all he was doing was using carbon offsets to reduce that. He got a lot of pressure to change. Prince Charles was going to fly to North America to receive an environmental award in New York and got beat up in the media about his carbon footprint. Now he reports on the carbon footprint of all his houses and what he's doing about it. People are deciding on which companies to buy from based on their green record. They want to do that because it's the right thing, and it's easy. We don't [have to] work from shame or guilt or fear. People need to be motivated for positive reasons, for their children, for the future or to do the right thing. The classic protest model is for people to say no and we want people to say yes. The big thing for me is getting people to be pro-active change leaders. We need to make change in a way that's sustainable. In the ascent office, we will be using David’s book, Low Carbon Diet: A 30-day Program to Lose 5000 Pounds, as a guide for creating an environmentally sustainable workplace. 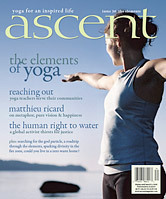 Check out http://blog.ascentmagazine.com/ for regular posts about our adventures!